Looking for a brand that features a diverse team of kids along with a great story-line? Then learn more about Gokul! World. We received the book "Gokul Village and The Magic Fountain" ($16.99) for review and was amazed by it. 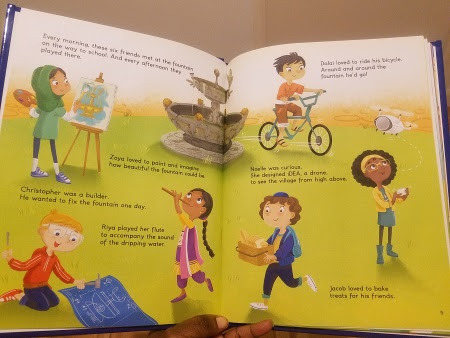 The book is filled with colorful illustrations that feature different cultures, along with a fun story where each kid using their own personal skill helps drive the story and problem solve. It's a great way for kids to understand they all can play a role in something, no matter the cultural differences. And it seems that's what Gokul! World is all about. In this first book, learn how Gokul’s fountain discovered its magic and how its magic transforms the lives of the children of Gokul Village. 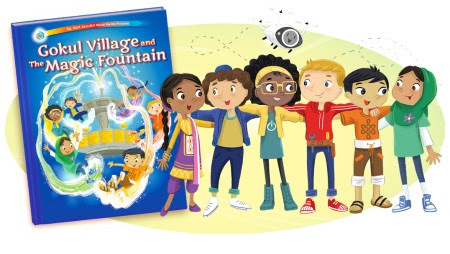 Join six friends - Riya, Dalai, Noelle, Christopher, Zoya, and Jacob, as they work together to restore their beloved fountain and save the day for their annual village New Year’s celebration. Find out how six friends set in motion a world of amazing adventures. As a multimedia property, Gokul! World aims to prepare children ages 4-7 for success by fostering exploration, understanding and celebration of cultural diversity. Besides the illustrated story book, the company will offer families digital shorts, an animated series, interactive mobile games, additional books and merchandise.